Bear With Me, developed by Exordium Games–a Croatian indie studio founded back in 2014–has a simple yet distinctive premise that’s sure to turn heads. 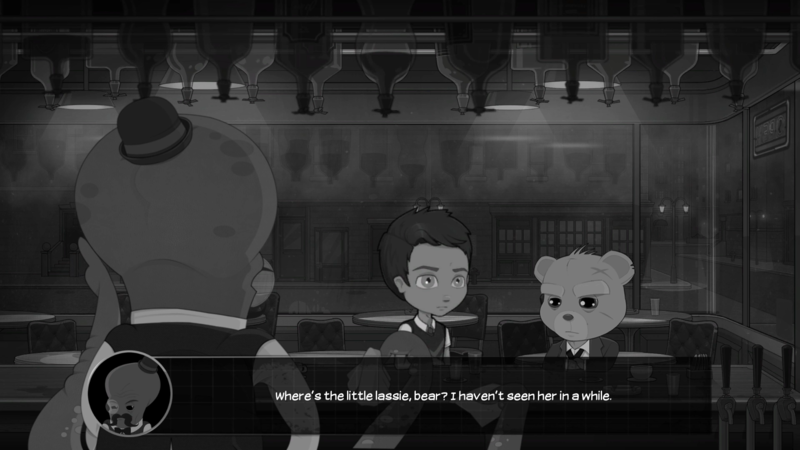 The title first released in 2016 with three episodes in which you play as a little girl named Amber who, along with adorable yet pithy detective Ted E. Bear, uncovers the truth as she searches for her missing younger brother. A fourth episode, a prequel entitled The Lost Robots, has players take control of Amber’s brother Flint as he works with the titular teddie bear detective as they traverse Paper City through a series of events leading up to the first episode. This was the episode I briefly got my hands-on experience with. 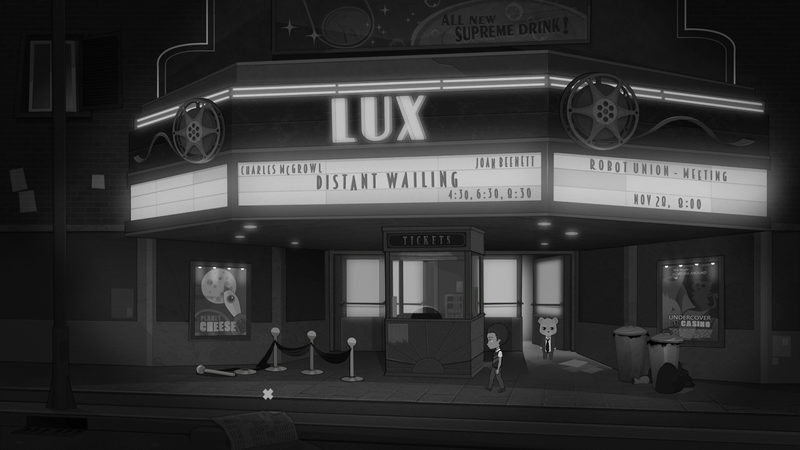 The visuals of Bear With Me captures your attention almost immediately, with its black-and-white palette meant to deliberately invoke the atmosphere of detective noir. Gameplay further delves into the genre, as the point-and-click adventure title relies heavily on clue collection and investigating your surroundings: a clever reason to feature all the hallmarks of the classic genre. My demo experience started in a trapped room scenario. Ted E. Bear, who had been examining a crime scene in a movie theater and was awaiting Amber’s arrival, ends up locked in the same area with Flint after the latter comes in her stead. With the door locked, I had to figure out an alternative escape route, accomplished by combing through the room for items and environmental clues. After a bit of pawing around, the characters clued me in to the fact that I first needed to move the large film projector blocking the window. This required me to pick up the crowbar and remove the bolts anchoring the machine down. The window was exposed but still locked so, after some more bumbling around, I figured that the best way to yank it open was through attaching the film reel to the projector and tying it to the window handle. Now with that done, the only conundrum remaining was to actually climb out the window to safety. This solution was much easier as it simply required me to tie two towels together and make a rope to hang out the window. As you can probably tell, this is an extremely methodical game that allows for no corner cutting. Every action has a logical place and must be carried out in the proper order. This alone is perfectly acceptable since most point-and-click games require this level of precision. However, the fact that Flint needed to physical walk over to every item before he could even look at it can get a bit tiresome, especially when you need to look over things across the room from each other. Finally outside, Flint and Detective Bear continue their investigation into the murder that he was looking into in the first place. I did some more picking around the crime scene for clues, taking care to examine the more mundane items for the amusing comments (gotta channel my Ace Attorney skills somewhere). With all the items stowed away, I can now safely enter the world map. The map has a pretty nifty anti-frustration mechanic: any area that still has evidence to collect is highlighted in red while areas fully cleared out look normal. At this point, the demo ended with a pretty cool-looking cutscene narrated by Bear as he told us his backstory. According to the developer, these cutscenes bookend the opening and ending of each chapter of the episode, a nice touch that makes the title feel more cinematic. I was also told by the developer that along with the main points of interest, there are also mini-games to play purely for fun, as well as additional notes to find that link this episode to the other three. Bear With Me: The Lost Robots is an engaging adventure game, and as noted before, it plays like an old-school point-and-click game just like the many titles LucasArts developed at the height of the genre’s popularity. Unlike the Lucas Arts games, failing to collect a piece of evidence won’t render the game unwinnable in the last moments; in fact, characters are very helpful in offering hints on how to proceed. Dialogue is punchy and smart, thoroughly drenched in noir-based pithiness, which is a staple of Western visual novel games. The characters, while an odd pair of human and stuffed animal, have a surprising amount of chemistry. Their personalities bounce off each other well and help keep what could be fairly repetitive gameplay engaging and often hilarious. The entire game is completely voiced and the actors do a stand up job of conveying their characters. The plot itself is conveyed well in the script and becomes even more interesting through the strength of those same performances. From what I experienced so far, Bear With Me: The Lost Robots was an enjoyable foray into an old genre. Fans of this classic style of game will be pleasantly surprised by this indie gem and should look into picking up the Collector’s Edition coming this summer, which comes with the first three episodes as well as the prequel fourth episode. The collection will release for PS4, Xbox One, PC, Nintendo Switch, Android, and iOS.